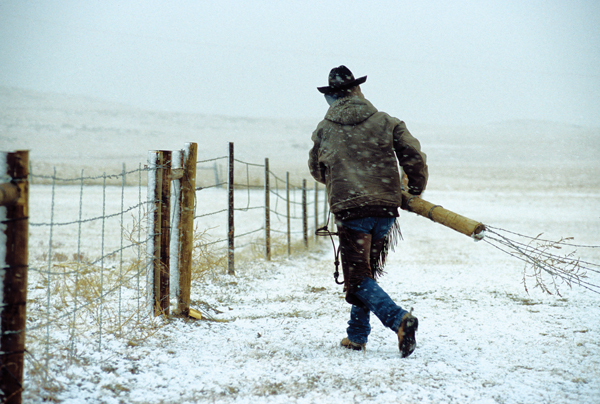 It’s the first day of spring, and a bitter Wyoming wind whips the falling snow into a frenzy, blowing horizontally into my numb face. The horses stamp their feet in anticipation; their breath fogs the dark morning air. Twelve cowboys and one cowgirl work proficiently in the cold, cinching saddles tight, talking excitedly about the 20-mile cattle roundup. My hands are so stung with cold that I’m having difficulty changing lenses on my camera. I mention to one of the guys that the wind feels pretty icy for a spring day. I turn my attention back to my uncooperative camera and wonder how many people in other lines of work would get up early in this kind of weather and love it. But Wyoming’s Warren Ranch has always attracted owners and hands with an abundance of enthusiasm, work ethic, and respect for the job. For a year and a half now, I’ve been chronicling Warren Ranch through photographs that portray this lifestyle in all seasons of the year. I’ve acquired a deep appreciation for the hard work of these ranchers and the close association that they share with the land.